The second Jim Brodie novel, TOKYO KILL is a fast-paced thriller steeped in Japanese and Chinese history dating all the way back to the 1700s (the Buddhist monk Sengai), but with a particular focus on unsavoury events from World War II. Antiques dealer and sometime private investigator Brodie feels the resonances of a wartime massacre when a World War II veteran arrives unannounced on the doorstep of Brodie Security in Japan, seeking protection. The old man’s son, and the firm’s staff, thinks he’s paranoid; his claims that he and his few remaining army buddies are in danger borders on delusional. But Brodie, still a novice in the private security industry agrees to provide a detail – what’s the harm, and besides, it might give the old man peace of mind. Instead, someone close to the old man is killed, validating his claims, and thereby throwing Brodie into a dangerous case involving Chinese spies, the savage Triads, Japanese kendo warriors, and an enigmatic group of killers connected to decades-old war crimes. Barry Lancet writes a competent thriller, stripped raw, possessing the bare essentials and none of the clutter that encumbers the competition. His chapters are short and snappy, almost Patterson-esque, and he utilizes foreboding final sentences to build tension and ‘page-turnability.’ This works for the most part, but on occasion it feels like a cheap tactic, unduly manufactured, particularly when it’s sprinkled with greater frequency towards the novel’s conclusion. There’s really no need for it, as the plot of TOKYO KILL is multi-layered and intriguing enough to stand on its own. Lancet weaves historic details about Chinese Art and the war years into his narrative, which spices up proceedings nicely, and is inserted into the plot sparingly, so its pace never slows. Various plot threads and characters tie together convincingly with a whirlwind of duplicity punctuating the novel’s end. 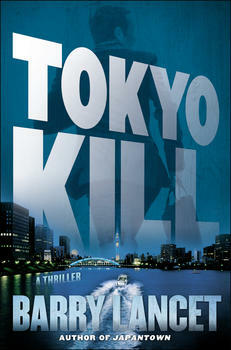 The action scenes, of which there are plenty, offer a nice blend of James Bond theatrics – the scene on board a ferry cruising along the Sumida River, Tokyo’s main waterway, springs to mind – while other scenes are more realistic; the finale is a brutal, bloody affair, not for the faint of heart. TOKYO KILL isn’t particularly innovative, but it’s finely executed; it won’t be long-remembered, but while you’re invested, it’s unputdownable. Don’t start reading before bed – begin at dawn, and prepare to cancel any plans you had during the day. My thanks to Simon & Schuster and Net Galley for providing this advance uncorrected proof copy of this novel. This review also appears at TheReadingRoom.